For this Hawaii saxophonist, surf’s up! Surfing while playing the sax. A cool way Reggie Padilla combines two of his favorite things! It can be a challenge to make time for all of our passions in life. But imagine if you could multi-task in this department: Do two things you love at the same time. 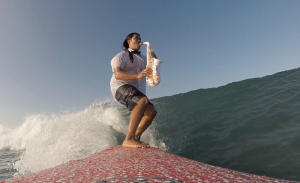 Hawaii resident Reggie Padilla did just that by combining his love for surfing with his love for playing the saxophone. Yes, he found a way to play the saxophone while he surfs. Recently, he captured one of his musical surfing adventures with a waterproof GoPro camera. The video has already snagged more than 100,000 hits on YouTube. Now, you might be thinking: The saxophone isn’t exactly a water-friendly instrument. Well, that’s true when it comes to the brass variety, which typically include leather pads and steel springs and screws. Plus, traditional saxophones can be heavy — so much so that they’re daunting to aspiring musicians.